This is so amazing!! What a fantastic picture!!! Captivating! Truly magnificent composition, color and perspective! This is one of the most amazing shots I've seen so far. Beautiful work! Wow I would love to visit this place it’s absolutely beautiful! This image was shot right on the main access to the Skogafoss waterfall, as soon as you leave the Ring Road. It was shot in June 2016, at 3 am, when the sun was starting to wake up the skies with powerful magenta tones. As soon as you leave the Ring Road, you just know than in about 5 minutes you'll be standing in front of one of the most epic waterfalls in the world, so it's very easy to not even look around our surroundings. Fortunately on this day I did, captivated by gorgeous lupine flowers on the side of the road. 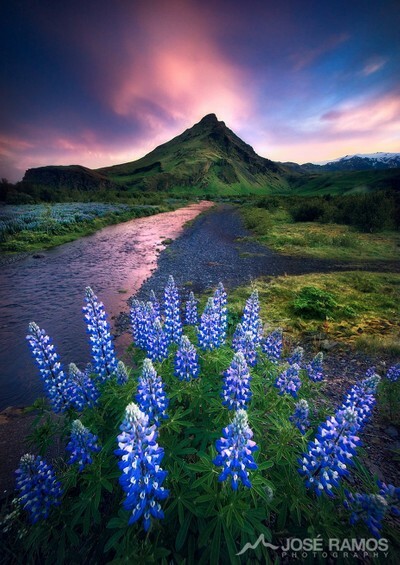 The sky was burning with color, so I decided to leave the car and scout a bit, which allowed me to find this fantastic combination of lupines, river, mountain and sunrise light. Not an easy photo to make, due to wind and lupine movement. As usual, I don't like to do exposure blending so had to make it work in a single exposure. A shutter speed of 1/15th second was the slowest I could go without blurring the lupines too much, while still allowing sufficient light to enter the sensor and not having to increase ISO too much. Aperture was f8, the largest I could use to still keep a large depth of field. Once more I went for the Sony 10-18mm at 13mm on Full Frame. Full scene exposure was made possible with the use of a Nisi 4 stop soft ND Grad filter.